This compact device is simply the best solution to bring any elevator system into compliance with the NYC Building Code 3.10.12 (Appendix K3). You can save money, time and frustration by using the only out-of-the-box solution. Unlike competing devices, The Argus Elevator Door Monitor does not require specific hardware configuration to match the variability in voltage levels of the different signals that need to be monitored. The configuration is accomplished via a beautiful graphical user interface built into the device. We can configure the device for you before shipping it, or you can do it yourself if you prefer. And do not worry, thanks to our innovative and patent-pending design, the device will not break if an input is mistakenly configured and a voltage significantly higher then its setting is applied to it. Each input can safely handle a rated voltage of up 300V AC or DC, regardless of its configuration. We are so confident in our products, that we back them with a 60-day unconditional money-back guarantee. If within the first 60 days of ownership you are not satisfied with the capabilities and performance of our Elevator Door Monitor, you can request a full refund by contacting us. The Argus Elevator Door Monitor is engineered and built to ensure its reliable performance through the decades. Any unlikely malfunction or defects are backed by our lifetime warranty. Thanks to its state-of-the-art design and patent-pending technology, Argus is the only one offering lead time measured in hours, not weeks. This is possible because the Argus Door Monitor inputs are truly universal and do not require special hardware configurations by the manufacturer to integrate with a specific elevator system. A successful, hassle-free installation can be further supported live by technical experts available past regular business hours. Live support is available both in English and in Spanish. The small size of the Argus Elevator Door Monitor offers flexible installation options. It can be installed inside the existing elevator controller or externally, in a dedicated small (7”x7”x4”) UL-listed enclosure. The beautiful graphical user interface provides an instantaneous visual indication of the status of each signal. This allows for easy identification and correction of any wiring or configuration problem. The Argus Elevator Door Monitor is the only elevator door monitor that records the eight most recent events. In case of a failure event, this allows quick identification and analysis of the circumstances responsible, decreasing the time needed for remediation and minimizing downtime. 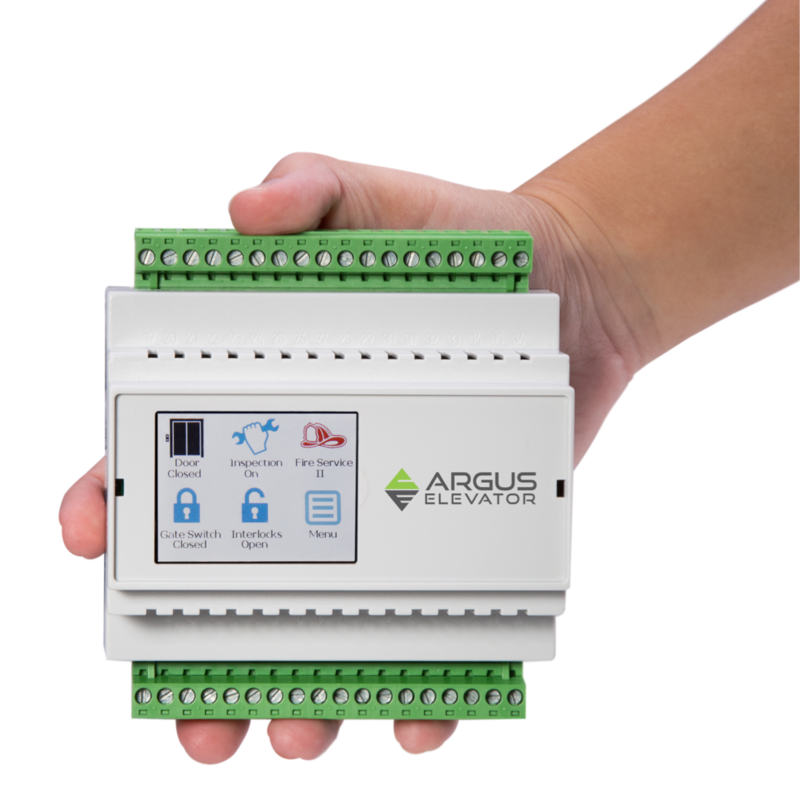 Unlike competing devices that rely on hardware logic, usually in the form of relays, the Argus Elevator Door Monitor is firmware-based. This means that in the case of future regulations changes, the device will be brought up to compliance thanks to seamless software upgrades. All that is needed is a PC and a serial cable that we provide. A very energy efficient solution consuming less than 3 Watts. That is about the same amount of power consumed by a single relay (out of many) used by competitor solutions. The innovative design of the Argus Elevator Door Monitored resulted in three patent applications.